Slovakia has accepted three ethnic Uighur Chinese prisoners from Guantanamo Bay detention camp, the Slovak interior ministry says. The three are now in the capital Bratislava, a ministry official said. None of them are terror suspects, the ministry stressed. Slovakia – a member of the EU and NATO – also accepted three inmates from Guantanamo in 2010. The US says all the Uighur prisoners have now been released from Guantanamo. Since 2001 the prison has housed suspects detained by US forces during operations against al-Qaeda and the Taliban. “As in the case of the first transport, the persons in this transport have never been suspected nor accused of terrorism. The transport is a follow-up to the agreement of 2009 [with the US],” the Slovak ministry statement said. A US Department of Defense statement named the latest three Uighurs as Yusef Abbas, Saidullah Khalik and Hajiakbar Abdul Ghuper. “These three are the last ethnic Uighur Chinese nationals to be transferred,” the statement said, adding that they “are voluntarily resettling in Slovakia”. “This transfer and resettlement constitutes a significant milestone in our effort to close the detention facility at Guantanamo Bay,” the statement said, and it thanked the Slovak government for its “humanitarian gesture”. The US refuses to repatriate Uighur detainees to China because of the risk that they could be mistreated. China has cracked down hard on Uighur dissidents who oppose rule from Beijing. The latest release brings down the total of Guantanamo detainees to 155. Many have been held there for more than a decade, and many were cleared for release years ago. More than 100 inmates went on hunger strike earlier this year. 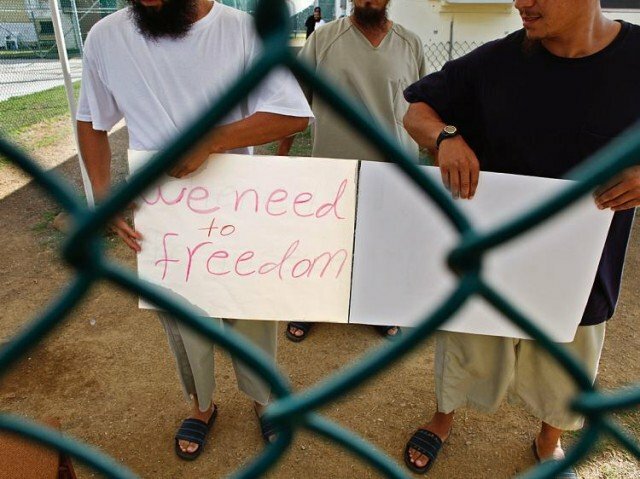 According to a prisoner list published on WikiLeaks website, 22 Chinese Muslim Uyghurs were imprisoned at Guantanamo by US forces after capture in Afghanistan. In April 2013, President Barack Obama renewed his call to close the prison, saying “it is inefficient, it hurts us in terms of our international standing”. Previously six Uighurs have been sent from Guantanamo to the Pacific island nation of Palau, while 11 others have gone to Bermuda, Albania and Switzerland. The Uighurs are a mainly Muslim, Turkic-speaking minority based in western China’s Xinjiang region.